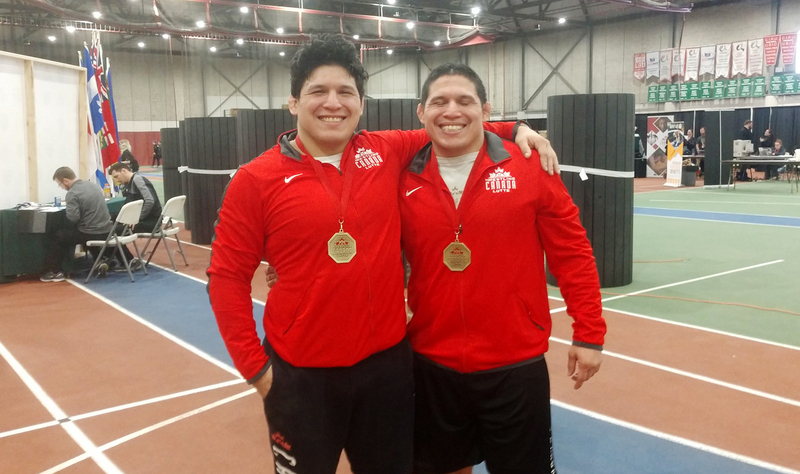 Identical twins Thomas and Phillip Barreiro are certainly double trouble for opponents on the wrestling mats. The brothers, aged 29, once again captured national Greco-Roman wrestling championships on the weekend. The Canadian meet was held in Saskatoon. Thomas Barreiro, who is five minutes older than his sibling, took top honors in the men’s 97-kilogram category. And his brother was crowned the champion in the men’s 87-kilogram division. The Barreiros, Wolf Clan Mohawks who live on the Quebec portion of Akwesasne, are hoping they continue with their wrestling successes and that they both go on to represent Canada at the 2020 Summer Olympics in Tokyo. Thomas Barreiro said the feeling would be unbelievable if both brothers, who represent Montreal’s Tristar Gym, do become Olympians next year. “That would be a real special moment,” he said. But he realizes the chances of that happening are not in their favour. Though they have been wrestling a good chunk of their lives, Thomas Barreiro said the siblings are somewhat behind some other rivals across the world because they only took up the Greco-Roman discipline in 2014. Greco-Roman wrestling forbids any holds below the waist. That differs from freestyle wrestling where competitors are allowed to utilize their legs for offensive and defensive moves. The brothers both thought their wrestling days were behind them after they concluded their freestyle wrestling careers in 2013. But they both decided to switch to the Greco-Roman discipline. They’ve both had considerable success in this style of wrestling. Thomas Barreiro won his fourth national title – and third consecutive – in Saskatoon. Phillip Barreiro is now a three-time Canadian champ in Greco-Roman wrestling, having previous won titles in 2014 and ’18. The brothers, however, didn’t have much of a challenge winning their latest championships. Just one other participant ended up showing up in their respective weight categories at this year’s nationals. “I can’t control who gets in front of me,” Phillip Barreiro said of the fact he had to win just one match for his latest title. Phillip Barreiro defeated Collin Johnston, a member of Ontario’s London-Western Wrestling Club, in his lone match. It only took about one minute and 40 seconds for Barreiro to be declared the winner by a technical fall (a mercy rule in which a competitor is ahead by at least eight points). As for Thomas Barreiro, his match was also stopped early, in the second three-minute period of action, after he took a 9-0 lead over Jackson Browning from the London-Western Wrestling Club. Thomas Barreiro was not upset at the lack of entrants in his weight class for this year’s Canadian meet. Thomas Barriero added he is thrilled that he took up the Greco-Roman discipline five years ago instead of abandoning the sport entirely after his freestyle wrestling days were over. When he’s not wrestling, Thomas Barreiro works as a diabetes prevention co-ordinator for the Akwesasne Boys & Girls Club. Akwesasne is a unique Mohawk territory as its land straddles the Ontario and Quebec border. And it also extends into the United States, into parts of the state of New York. Both of the Barreiros’ jobs are in the New York portion of Akwesasne. Phillip Barreiro works as an administrator for Akwesasne’s tribal court. Thanks to their wrestling careers, the brothers also have some upcoming travels. First up they’ll compete at the Pan American wrestling championships scheduled for April 18 to 20 in Buenos Aires, Argentina. The Barreiros are also hoping to take part in the Pan American Games, set for July 26 through Aug. 11 in Lima, Peru. And after that will be the world wrestling championships in Kazakhstan, from Sept. 14 to Sept. 22. All of these meets will serve as opportunities to qualify Canada for spots at the 2020 Summer Olympics. Should that happen, to become Olympians the Barreiros would still have to have success in their divisions at the Canadian Olympic wrestling trials, scheduled for this December in Niagara Falls, Ont.